Dalinda Gonzalez-Alcantar sits at a computer at the Boys and Girls Club in McAllen. Gonzalez-Alcanter co-founded Border Kids Code, which teaches children basic coding over the summer. She will be attending South by Southwest in Austin to talk about engaging minority children in technology. Border Kids Code co-founder, Dalinda Gonzalez-Alcantar, didn’t try sushi until after college. Before that, she didn’t even know what it was. Her son, however, tried the Japanese dish for the first time at age 7. 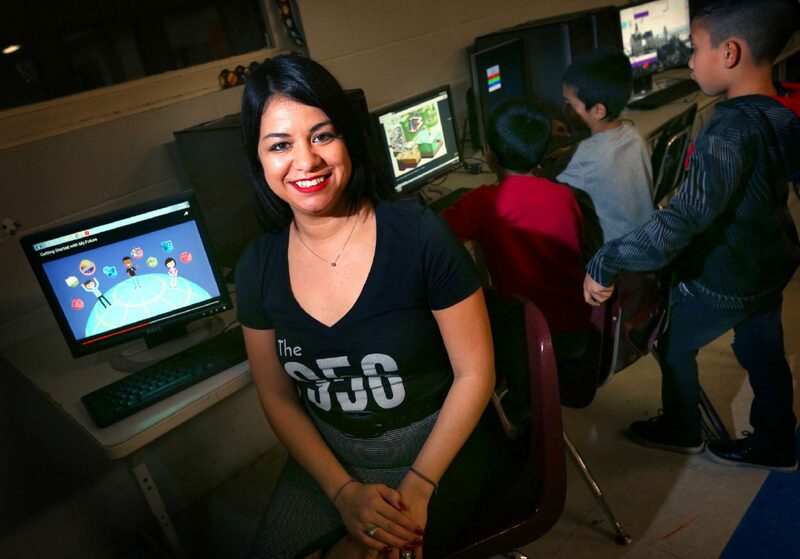 One of the reasons Gonzalez-Alcantar, 37, and her co-founder, Marcos Silva, started Border Kids Code was to address a problem that plagues most minority and low-income communities: “learning loss” over summer vacation. “A lot of times you have students in a certain socioeconomic status that can’t really afford to have a summer learning experience: things like going to camps, or even having basic transportation for going to the library,” she said. “So, we continue to see kids decline when it comes to learning as opposed to their counterparts who are often engaged in learning over the summer. Over the summer, students participate in more than 120 hours of curriculum taught in English, Spanish, and of course, code. There are currently 1.2 million jobs in tech unfilled, and teaching children to be “trilingual” makes them uniquely qualified to fill those positions, she said. Gonzalez-Alcantar has 13 years of experience in education, and is also executive director of the Boys & Girls Club of McAllen. There, she works to create opportunities for children to learn the fundamentals of computer science — something she said is “invaluable,” but might not be taught in their schools. In her case, she learned how to code via YouTube videos, which she said required “just being really terka (stubborn),” and practicing basic problem-solving skills. “It was always out of reach for me, at least financially,” the Texas State University graduate said. Out of the three Valley natives participating in interactive media events at SXSW, she’s the only one who’s based locally. To her, the most important part is “sitting at the table and having these conversations,” and looking at the big picture. “For me, going to SXSW is a little tough because sometimes it’s hard to talk about things in color, and share the reality that Texas is going to be a majority-minority state and if we don’t really get with it, it can really have economic effects,” she said. “It has huge repercussions. It’s not just about kids flying a drone or looking at a VR headset; it’s about teaching them their options so that this state can still be OK when we become the majority. This is the third of three profiles of Rio Grande Valley natives participating in South by Southwest interactive media sessions in Austin.